Now let me tell you about his successors: in rhyme, which isn’t easier. Tiberius retreated to Capri, he was one grumpy mister. Caligula loved killing and slept with his sister. but ruled well and conquered Britain, his success absurd. Murdered his mum and Rome went up in flame. First came Galba, who thought gold was mighty fine. Vitellius was bigger and fatter than any predecessor. Titus reigned well, but Pompeii and Rome went up in smoke. an assassin ended the life of the last Flavian. the Antonines, thought the best rulers of the Empire’s fifteen century life. Hadrian defended the empire well and loved a Greek boy. Antoninus Pius, twenty years of prosperity and peace. But when he died, the Golden Age began to cease. but party-animal Lucius soon came under the weather. thankfully the remaining emperor was Marcus Aurelius, wiser was no man. was the how he picked his successor. pretended to be a gladiator, such a sight had never been seen. so the Praetorians killed him, disliking the interruption. Didius Julianus then won the Empire in an auction in a bar. Clodius Albinus, Pescennius Niger, and Septimius Severus didn’t accept that and started a civil war. Septimius ruled with iron fist, caring only for the army. His sons Geta and Caracalla drove each other barmy. Elagabalus’s reign reads like a dark comedy. but his death was the start of the Empire’s darkest time. of fifty years of civil war that tore the Empire apart. we call this disaster the Crisis of the Third Century. Maximinus Thrax was a massive fighter, a real brute. Showed two Gordians that rising up against him was an idea that was not good. only to be assassinated by the Praetorian Guard. before Philip the Arab took his life. Decius persecuted the Christians, thinking they were a curse. Hostilian, Trebonianus Gallus, Aemilian, things are only getting worse! captured in battle, made a Persian slave with no power. Palmyra in the east and Gaul in the west. while east and west were run by his imperial peers. when a Gothic invasion was beaten by Claudius Two. and then the great Aurelian reunited the Empire, ruling alone. as next came Tacitus and Florian. Carus was killed by a bolt of lightning. who were replaced by the great Diocletian. by reorganising the Empire into what we call the Tetrarchy. which makes quite a challenge for a simple rhyming dunce. With Constantius Chlorus and Galerius, they made quite the band. trouble started: Constantine and Maxentius wanted to be the next Emperors to be hired. and then Maximian came back from his retirement spell. then died on his farm, quite possibly of stress. then, at last, Constantine beat the others and ruled alone. and moved the capital to a little town we call Constantinople. he also named his kids Constantine, Constantius, and Constans, without any shame. Constans lived longer, but was then replaced by general Vetranio. until he made his cousin Julian co-emperor, thowing him a bone. when he charged into battle without his armour on. then Emperor Jovian inhaled carbon monoxide. his brother Valens lost his life in the battle of Adrianople. Valentinian Two was the last emperor to choose to rule the west. a religious man who listened well to Saint Ambrosius. from now on, the two would have a separate throne. unfortunately, Arcadius and Honorius were useless morons. while Honorius worried about his chickens during the Sack of Rome. while in the west, Honorius at last died. but Theo appointed Valentinian Three, who attacked the west and won. going through terror at the hands of Attila the Hun. Now the west had Petronius Maximus, what a flop! Vandals raided Rome and he was stoned by an angry mob. as barbarian Ricimer took over their crumbling Empire and made them little more than a wall flower. while in the east, Leo the first began the Empire’s recovery. had Ricimer not become jealous and killed you dead. Ricimer poisoned him, and he too was kill. fought Vandals and Visigoths, then Ricimer made sure he died. barely anyone now would even listen to the emperor’s command. but the history books disagree, as Orestes had him overthrown. put his fourteen-year old son on the throne, just before the fall. and it is only because he was last that he achieved any fame. and then the west had no more emperor. though the people were worried because he was a monophysite. couldn’t read or write, so he asked help from his cousin. and he rebuilt the Empire, earning everlasting fame. but oh that plague was such a pain. but Tiberius stepped in when Justin went quite coocoo. a mistake partially rectified by emperor Maurice. it was the last great war of antiquity. half of it occupied, Persians knocking on Constantinople’s gates! and with the sudden attack of his people, the Empire was broken. and promptly died of a broken heart. Constantine Three and Heraklonas were not long for this world. Constans the Second’s beard was neatly curled. which in Constantinople caused much unrest. 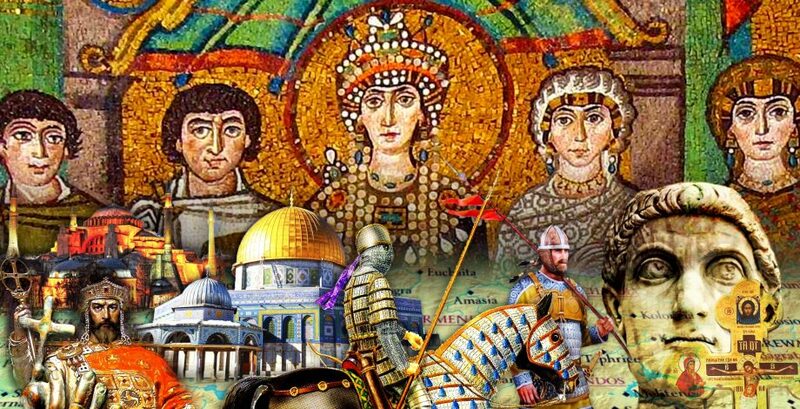 Constantine Four fought off an Arab attack on Constantinople without mistake. but Leontios rose up, exiled him, and slit his nose. now with a wife called Theodora by his side. he only hung on to it for one year before they also slit his throat. it had been the start of an anarchy that lasted twenty years. then came Justinian Two’s return. two years later, he was taking a bath when someone poked out his eyes. he warned all to stock up food, as the Arabs were preparing a siege. then Isaurian Leo Three became emperor, and he wasn’t a fool. the Arabs sieged Constantinople by sea and by land. so he began what we like to call iconoclasm. for which historians named him dung. Leo Four came next, and he wasn’t long for this world. and she was regent for their son, a sixth Constantine. so she deposed her son and ruled as the Empire’s very first empress. and so his skull became a drinking cup for Khan Krum. then Leo the Fifth, a general with iconoclastic belief. Theophilos tried to make sure justice was something everyone would have. he spent his rule as a puppet to friends and family. a great general, he was the first in ages to conquer enemy land. Alexander died of exhaustion after playing polo. deposed for twenty years by the Romanos Lekapenos regime. the Roman Empire began to score many a win. then Nicephoros Phocas took Antioch, no mean feat! who fought Rus’ and Bulgar, and on both accounts won. conquered Bulgaria and Armenia, adding to the Empire’s might. then his daughter Zoe became the second empress. but perhaps they shouldn’t even have tried. lost Sicily, the Balkans, and nearly caused a civil war that wasn’t so fine. lasted six years before the Empire had to miss her. as his enemy Isaac Komnenos was so very big and stronk. when it was taken over by the Norman men. but Romanos lost Anatolia at Manzikert, what horror! he was blinded, then Mike had to give the throne to Nicephoros Three. on all sides, the odds against them were stacked. and did his best to make them recover. then asked for some help from the west. so was quite surprised when this started the First Crusade. he still teamed up with them, as needs must. Manuel Komnenos was a very energetic mister. when cousin Andronikos caused his overthrow. but was pretty dismayed by his own lynching. then was blinded by his own brother. especially with the arrival of Crusade number Four. as the Crusaders conquered Constantinople and brought the Empire to fall. Nicaea held the ashes of the purple phoenix. John the Third gave Latins and Bulgars plenty more good fights. while John Four was too young to rule, and was put under a regency. making every Roman briefly hopeful. But Andronikos Two was little better than the first of the name. Neglecting defence, he brought the Empire to shame. sparking an unfortunate civil war. and their fighting nearly ended the Empire’s life. had to become an Ottoman vassal. next John Five fought Andronikos Four and John Seven, seeing double. the next emperor was clever Manuel Two. the Empire could rise one last time again. as the Ottomans reunified, and they were tough. and in fifteen centuries, a braver emperor hadn’t been seen. and with that came Constantinople’s fall. but that day, the Roman Empire became a thing of the past. This is great! Any chance we could get a podcaster with a soothing English accent to record and post a reading of this? Yeah, I’d love to hear this recorded. By anyone, really. Was this posted on Reddit a while ago? Wow, thanks for featuring this, it’s pretty awesome to see my dubious rhymes posted on my favourite podcast’s site. And thanks for the kind words, everyone who commented!